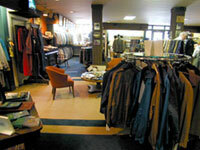 Hunter and Coggins is a locally owned store for men's apparel located in Asheville, North Carolina. We invite you to visit our business at 28 North Spruce Street (across from Thomas Wolfe Plaza) or call us toll free 1-800-343-9396 or locally at 828-252-8496. 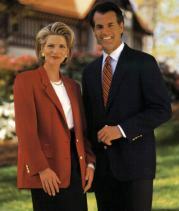 We carry Alan Paine, Barbour, Berle, Bill's, Corbin, Gitman and Co., Hardwick, Pantherella (hosiery), Peter Millar, Robert Talbott (neckwear), Royal Highnies, Torino and Trafalgar (belts), Smathers and Branson (needlepoint accessories), Southern Tide, Scottish sweaters by McGeorge, and Zanella. We carry clothing of all kinds: school uniforms, suits, ties, trousers and any other essentials you might need. Recently I purchased 3 blazers from your establishment. I must admit I was skeptical at first due to their unusually low price, but I couldn't be happier with the fit and quality of these garments. Senior Vice President/Branch Manager The Robinson-Humphrey Company, Inc.
We offer blazers at unbeatable low prices and we take pride in the personalized attention we give to each of our customers. Our blazers come in a wide range of sizes, with no additional cost for the big and tall sizes. Alterations are available and if you order by mail you can expect to receive your blazer within five business days.